Remove the outer leaves of the cabbage that have blemishes or tears. Cover the bottom of a baking dish with a layer of these leaves. Doing so will prevent your stuffed cabbage rolls from burning. Cut in a circle all around the stem of the cabbage and remove the core. Place the cabbage in a large pot and fill it with water, covering the entire cabbage head. Bring to boil. After about 2 minutes, the leaves will start to come loose. Pull them each off and out of the water using tongs. Repeat until you have at least 15-20 leaves. Pat leaves dry with paper towels. Set aside. In a medium skillet, add 2 tablespoons olive oil and add onion. Cook until softened and translucent in color. Set aside to cool. In a mixing bowl combine rice, ground turkey, cooled onions, salt, pepper and parsley. With stem side of cabbage leaf facing you, place a heaping teaspoon of the mixture in the center of cabbage leaf. Fold the bottom edge over the mixture and then fold the sides over and roll into a tidy package. Place the cabbage rolls, seam side down in the baking dish which you previously layered with the outside cabbage leaves. 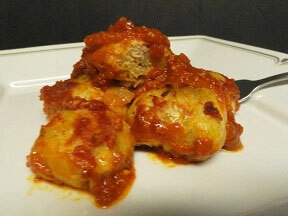 Pour Tomato sauce over cabbage rolls. Add 2 tablespoons of margarine on top of sauce. Cover with foil and bake for one hour. Remove cover for the last 20 minutes of baking time. This will make a tray of 15 to 20 cabbage rolls.